[PDF] Research Methods in Education, 7th edition | Free eBooks Download - EBOOKEE! 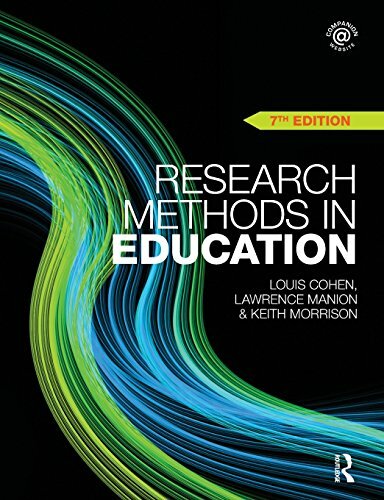 Description: This rewritten, expanded and updated 7th edition of the long-running bestseller Research Methods in Education encompasses the whole range of methods currently employed by educational research at all stages. It offers plentiful and rich practical advice, underpinned by clear theoretical foundations, research evidence and up-to-date references. Chapters new to this edition cover: Causation, critical educational research, evaluation and the politics of research, including material on cross-cultural research, mixed methods and participatory research Choosing and planning a research project, including material on sampling, research questions, literature reviews and ethical issues Meta-analysis, research syntheses and systematic reviews Virtual worlds and internet research Using and analysing visual media and data in educational research Organizing and presenting qualitative data, content analysis, coding and computer analysis, themes, narratives, conversations and discourses, grounded theory Understanding and choosing statistical tests, descriptive and inferential statistics, multi-dimensional measurement and factor analysis Research Methods in Education is essential reading for both the professional researcher and students of education at undergraduate and postgraduate level, who need to understand how to plan, conduct, analyse and use research. PowerPoint slides for every chapter contain an outline of the chapter structure followed by a thorough summary of the key points, ideal for both lecturers and students. Within the book a variety of internet resources are referred to and these references have been included here, with links to the websites. A wide range of supplementary documents are available for many chapters, providing additional guidance and examples. They range from guidelines for the contents of a research proposal with a worked example, to screen-print manuals for using SPSS and QSR N6 NUD*IST (exportable to N-Vivo) plus data files. No comments for "[PDF] Research Methods in Education, 7th edition".